In my recent Back to the Future of Agile Software Development essay, I posited the maxim that Agile is continuous problem-solving. Whether we create new designs or architectures, or cope with various challenges that software development abounds with, we need to generate brilliant ideas on demand. This is our job, and we have to be good at it every step of the way. I’ll highlight just one very important idea. It’s about shifting the focus from time management to energy management. If we treat ourselves as mechanical robots with unlimited capacity to produce good decisions and creative solutions, filling up all the time slots in our schedules, both for work and non-work, this influences our creative powers, choices and decisions. No wonder that with such a nonstop lifestyle, we then find that a high-priority decision we’ve made, or a technical solution, has some crucial flaws. That’s why the author recommends something that I would call a holistic planning of energy consumption across all the areas of our life, not only at work. The book is filled with subtle observations, practical techniques and is indeed a feel-good read. Truly indispensable if you’re serious about keeping good health and creative (a.k.a. problem-solving) capabilities for many years to come. The universal law of energy conservation is pragmatic. If the energy is dissipated into many random directions, you’re losing out in the end. The draining gets hold of you insidiously. It might seem that all is going well, until at 30+ or 35+ your health crashes down and sends pleas for help disguised as chronic diseases and fatigue. I had to make some tough choices for the sake of holistic energy management, and put some of my creative pursuits on hold. Many of you must have had similar experiences. Here’s the one piece of advice that I can give: stay away from stressing yourself out and cramming your life with the low-priority activities. It’s about slow-paced, meaningful insights and keeping yourself in good shape to do just one high-priority thing — and if it is work, this should be work. The media are dictating that we should speed up. Thanks, but no thanks. What we really need is to slow down. 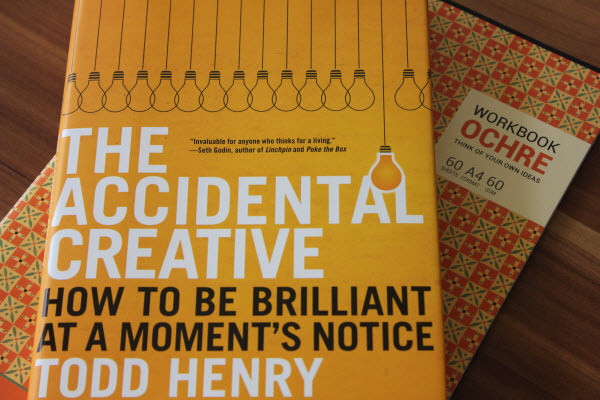 Hopefully, this brief review will encourage you to grab The Accidental Creative (no, I don’t get any referral fees for that), and apply those ideas and practices to your life. This book will really help you keep good health AND exercise your creative powers to the fullest.